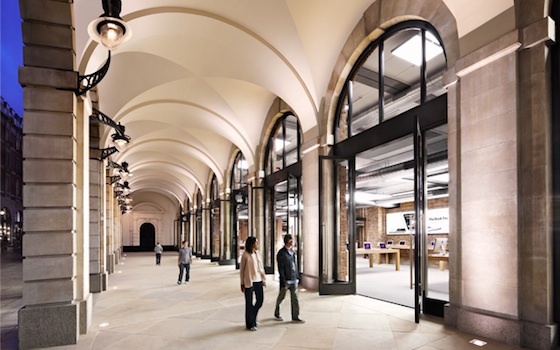 Apple has notified staff members at its massive Covent Garden retail store in London that the store will be closing early next Tuesday in order to accommodate a press gathering to view a simulcast of Apple's "Let's Talk iPhone" media event. The store will be closing at 3:30 PM on Tuesday, significantly earlier than its usual 9:00 PM closing time. The media event will begin at 6:00 PM London time. Apple has in the past hosted press gatherings in London for its media events, although they have generally been held in off-site locations and not at any of Apple's retail stores. "Sorry shoppers, we're about to watch a live video so could you all please GTFO!" yes, that is the case, oh and we only work 4 days a week. If you actually read the article you'll notice that it's for British press who could not otherwise be at the actual event in California, or because they'd like a larger press presence from other countries, not exclusively for store employees. Guess that means there'll be no live stream for the rest of us then if they are selecting a location for additional press. Was really hoping they'd stream it for the rest of us. You'd still get the press and tech blogs going to the actual keynote for both the experience and the "hands on" and Q and A sessions. There must be something big in the keynote for them to shut down a store?? Not really. They chose that store for the press. one up you - I am one of the lucky "American Dreamers" ( they keep telling us to chase the american dream, it's a scam-worked 16/7 and lost it all during the recession) and now I am lucky to get 15 hours a week at an American mega-corporate grocery store chain! Anyone in the UK need a talented American in need of work? Covent Garden Store here I come! You could just all come to our coverage of the keynote in a London pub. Justgoogle the London mac user group for details. Beer being severe, curry from the kitchen and 3 projectors ready to rock!